Marietta's architectural centerpiece is the Love County Courthouse (c 1910), the first courthouse built after statehood and topped with a clock dome. You'll also find the Love County Military Museum with memorabilia from the Civil War to the Persian Gulf War, - Norton's Indian Territory Museum, and the Love County Pioneer Museum in the town's historic Santa Fe Depot. 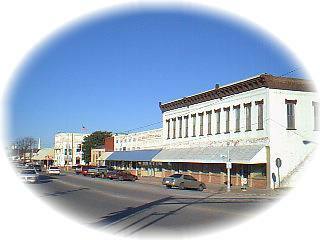 Marietta was founded in 1887 as a station on the newly-completed Santa Fe Railroad, near the site of a grist mill, general store and campgrounds on the Arbuckle Cattle Trail. This trail crossed the Red River from Texas at Thacker Ferry north and west of the present day Thackerville and then joined the Chisholm Trail further north and west of Love County. The museum houses Indian Territory relics and the largest collection of antique medicine and pop bottles in southern Oklahoma. The Military Museum houses memorabilia from the Civil War to the Persian Gulf War. It is located in the renovated old jail at the southwest corner behind the Love County Courthouse.